One of my cases recently received a great deal of media attention, including on Good Morning America. It is a sad case of what happens when an IVF clinic fails to appreciate the importance of informed consent and transparency in freezing embryos. Marisa Cloutier-Bristol first learned in August 2017 that Women & Infant’s Hospital in Providence had been preserving her frozen embryo in storage since 2004, the year she underwent in vitro fertilization treatments with her husband, and that they were going to start charging her $500 per year to store it. They offered that she could discard it, donate it, or have it put back into her. This shocking news devastated Ms. Cloutier-Bristol, then 44, who for 13 years had assumed that four embryos she and her husband produced had been destroyed and discarded after being told by her physician that they were “abnormal” and none should be implanted in her uterus. However, the hospital actually froze one of the embryos without her knowledge or consent. Unaware of another chance at having a baby, the couple decided to stop attempting to conceive through in vitro fertilization. The hospital never asked the woman and her husband to sign a consent form indicating each partner’s wishes on what to do with the embryo in the event of divorce or death. The woman’s husband died unexpectedly in 2006 of a heart attack. Absent the consent form, the hospital is ethically and legally prohibited from doing anything with the embryo. It must remain frozen . . . for eternity. Since the 1990s the standard of care has been to have couples agree in writing before undergoing in vitro fertilization treatments as to what will be done with embryos that are frozen should one of them pass away. Hopefully, this highly publicized lawsuit will serve as a reminder to IVF clinics everywhere that they have tremendous responsibility not only to their existing patients, but to the thousands of potential lives they are storing. They are not just preserving an embryo, they are preserving a couple’s hope and desire for a child for them to love. Nothing could be more delicate. For her full story, please see her video on You Tube. For more information, please contact Jeffrey Catalano at jcatalano@toddweld.com or 617.720.2626. Jeff has been selected to the Best Lawyers in America directory for personal injury and product liability litigation (plaintiffs) for five consecutive years (2015-19), and has been designated as one of the Top Rated Lawyers in Medical Malpractice by The Boston Globe and Wall Street Journal. 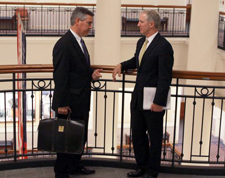 He has been chosen as a New England Super Lawyer each year since 2009.